The registration fee will be 50 $ (use cash for the fee at the registration desk). The registration will start on Monday the 4th of September at 18:00 at the Conference Hotel and will continue on Tuesday the 5th of September from 9:00 at the conference room. It is recommended to arrive the 4th of September. Ensenada is full during that weekend because of "Labor Day" (USA vacation), and there will be probably no rooms available. There are, however, a number (all prices) of hotels/motels near San Diego airport and downtown, for those of you with early arrivals. Family room (up to 6) 79 $. Breakfast will be 6 $ per person. Check in will start on Monday 4th at 1:00 PM at the front desk. Monday 4th (8:00 PM): Wellcome reception at Hotel Mision Santa Isabel. Wednesday 6th (8:00 PM): Restaurant "623" wine tasting ***** 40 $. Thursday 7th (8:00 PM) : Restaurant "El Charro" conference dinner ***** 30 $. Saturday 9th morning (half-day trip): Tour to the wineries at Guadalupe Valley ***** 12 $. interest in the Saturday tour to the wineries (12 $). 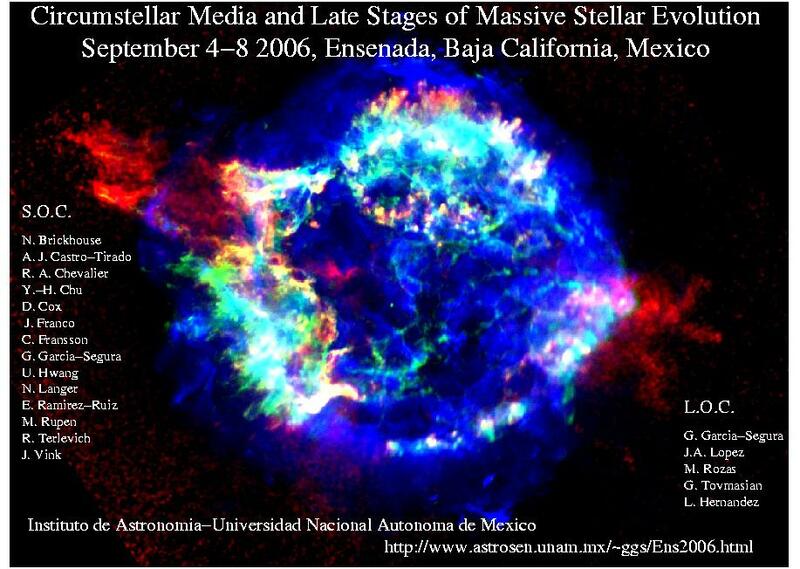 Revista Mexicana de Astronomia y Astrofisica Serie de Conferencias.